Morton closed the gap on second-placed Dundee to five points in the Ladbrokes Scottish Championship with a 2-0 win at home to Raith. 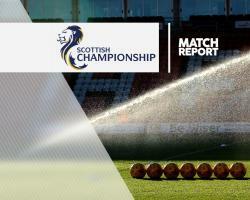 Ross Forbes and Lawrence Shankland scored in either half as Jim Duffy's side stayed unbeaten in five matches while Rovers are now winless in nine. Forbes crossed for Shankland who could not connect with a header, confusing Rovers goalkeeper Kevin Cuthbert, and the ball curled into the net. Cuthbert partially redeemed himself shortly before the break, denying Thomas O'Ware from close range. The Ton continued to press after half-time and deservedly went two up on 67 minutes, Shankland nodding in Mark Russell's cross to the back post.